Since the weather is finally improving and I, like you, need to indulge in some vitamin D and outdoor exercise, Jittery Cook is cutting back — posting once a week for now. Please continue to send in your comments so we know what you are cooking and how recipes are turning out. Thank you to my dear co-worker and friend, Helen Lewis, who suggested Robin Asbell‘s New Vegetarian book as inspiration for Jittery Cook. I couldn’t resist the temptation to give this Roasted Grapes and Butternut Squash Salad – with Pistachio Chèvre my full Jittery Cook treatment. I took the liberty of substituting squash for golden beets. Preheat the oven to 300F. Toss the grapes with a drizzle of olive oil in a small baking pan. Put the squash in another baking pan with a drizzle of olive oil, toss, and put them in the oven with the grapes. After 20 minutes, remove the grapes from the oven, then raise the heat to 400 degrees and roast the squash until tender, about 10-15 minutes more. Let the squash cool. 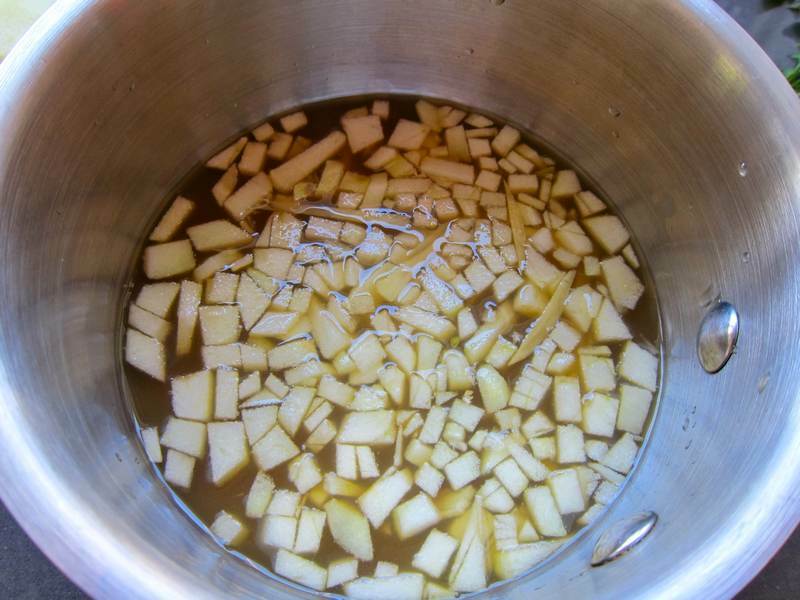 In a small saucepan, bring the apple juice, apple, and ginger to a simmer. Cook until it’s reduced to a syrup. Let cool. Then whisk in the lemon juice and olive oil, and season with salt and pepper. 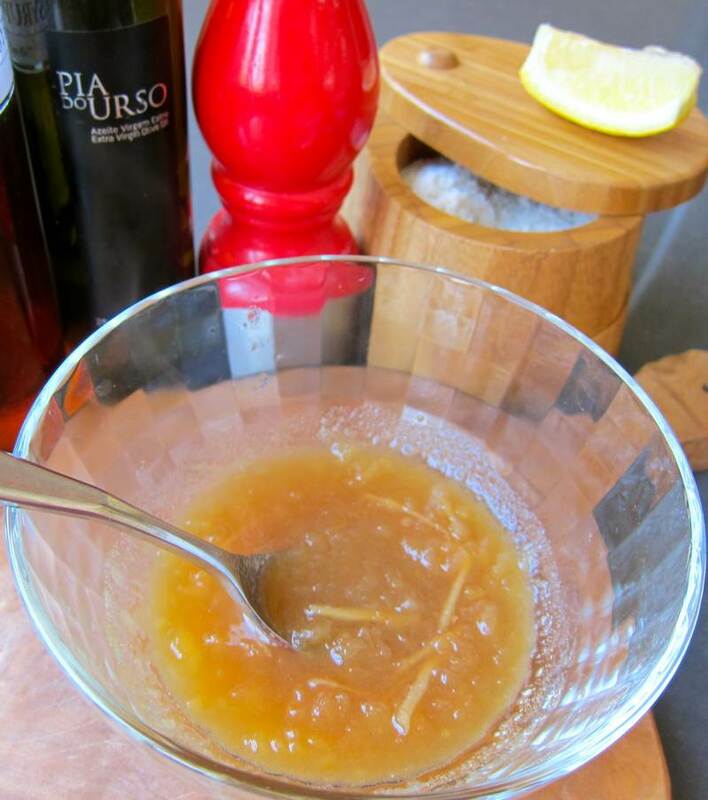 If it is too sour, add a bit of maple syrup or a pinch of sugar. Mix the pistachio and thyme in a small bowl. 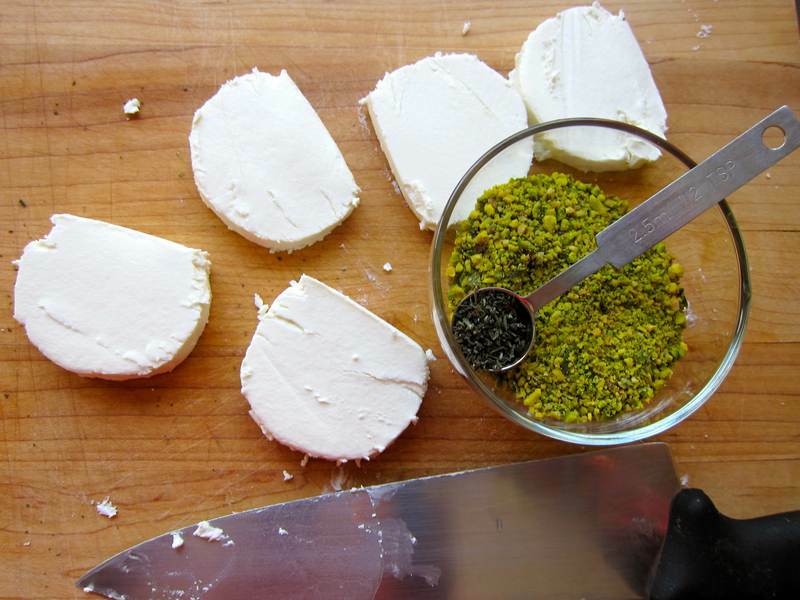 Cut the log of cheese into 6 slices, then dip the slices in the pistachio cheese mixture. Let come to room temperature. 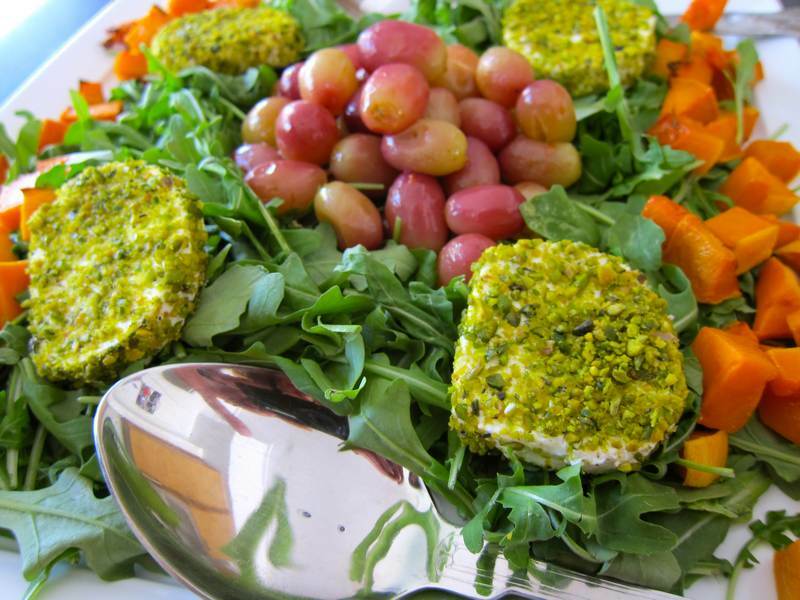 Spread the arugula on a platter or individual salad plates. 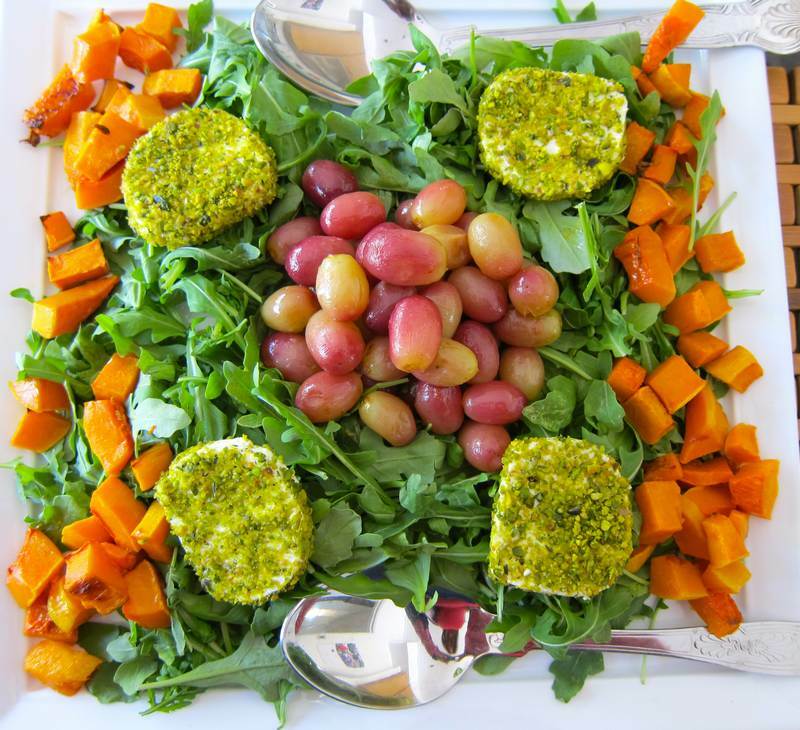 Arrange the squash around the edges and pile the grapes in the center. Drizzle the dressing over the salads and place the cheese on top. Garnish salads with thyme sprigs. Serves 6. Thank you to Chronicle Books for permission to post 3 recipes from the lovely New Vegetarian book. This salad would be equally delicious if the grapes were not roasted, just sliced in half, or replaced with a firm pear, cut in cubes or slices. Thanks to your insistence and my slowly emerging computer savvy, there is finally a print ready version of the Jittery recipes on each post, all the way back to January 13, 2012. Look for the links below each recipe saying “Print Ready Recipe.” My apologies to everyone who struggled to print the recipes with all the photos included. As they say, better late than never. « Socca – Chickpea flatbread from Shorty! I got to have this for lunch in the test kitchen! It is as pretty as it looks. 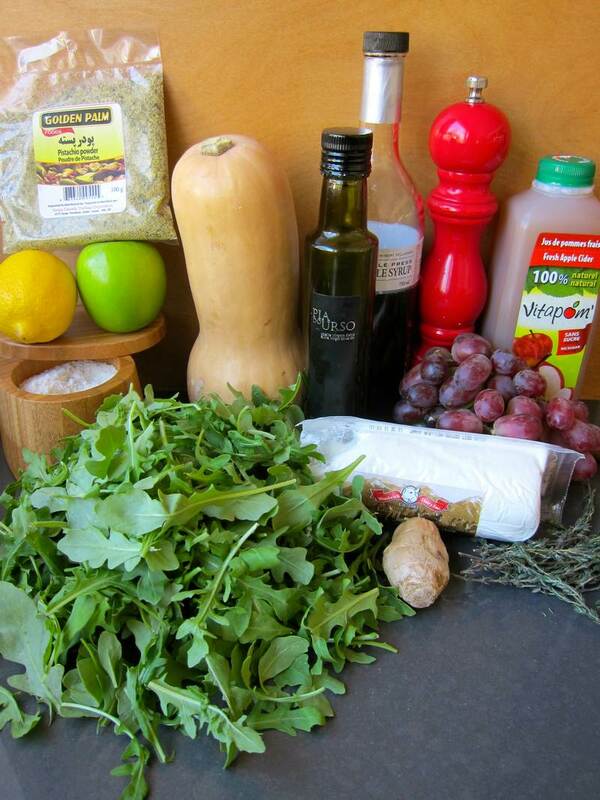 The little squash pieces and chevre are a nice contrast to the spicy arugula. I am not a big fan of roasted grapes but thats a personal thing. It’s a great recipe and Holly’s presentations are as good as her food. There’s no testing in this kitchen. Just kidding. It’s generally a one shot deal. I have no patience for do overs. Thanks for coming & congrats on winning the nibs and so glad you like everything Jittery!